The Easter holidays are the one time of the year I don’t manage to take any time off and this week…….well, what can I say! Gutted that’s what! How beautiful is it, such a change from miserable March that’s for sure! So while I am donning my work uniform Olivia is parading about in her (yet again) vast collection of summer dresses. Jealous, moi? Maybe a teensy bit ha! But onto the little lady herself who has chosen this pretty red dress which was a bargain buy from Barnado’s charity shop for only £1.99 in age 12-13. 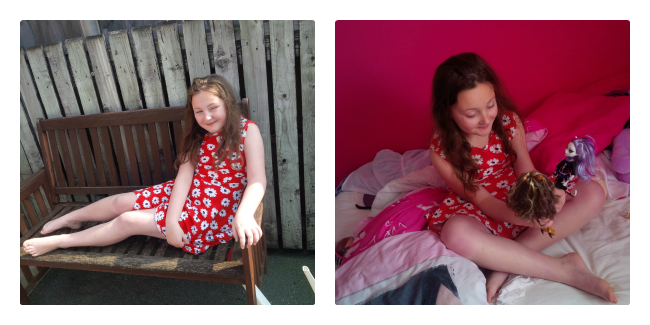 This dress is a Matalan dress and comes pre-loved she doesn’t mind though she just loves new clothes! Next The Dresses Are Out! That was a bargain, very pretty summer dress.